This is a Customer Management article from guest poster Dave Kahle, author and leading sales educator. Follow Dave’s latest Tweets at @davekahle. There is not a salesperson in existence who hasn’t repeatedly heard of the need to “close the sale.” Every new sales manager must view the process of encouraging his/her sales force to “close the sale” as an initiation into the profession. If you’re going to be a sales manager, you, therefore, must improve everyone’s ability to “close.” Doesn’t it come with the job? The sales training literature is awash with advice. Some of it tedious and trivial: “If he says this, you say that.” Other advice is grandiose: “35 new sure-fire closing techniques.” Still other is harmful. “Overcome that objection,” as if selling in the B2B world was a contest between you and the customer, with one of you winning (overcoming) and the other losing (being overcome). That’s an attitude that won’t get you far. Not that there is no need to “close.” Every project must come to a conclusion, every offer be resolved one way or the other. It’s just that, in my experience, closing has never been the result of verbal gymnastics on my part. It’s not my clever refrains, my slick tactics, my memorized “objection over-comers” nor my manipulative perseverance that has brought me business. Instead, it was the suitability of my offer to the needs/desires/values of the customer. On those occasions where my offer precisely met the customer’s combination of desires, values and preferences, I got the business. Where my offer was off, and some competitor’s offer was a closer match, I didn’t get the business. I don’t mean to imply that every sales opportunity is that black and white. Clearly there is a lot of grey area in the process. But, from my perspective, the grey area tipping point was most often the personal factors of rapport, relationship and trust, and almost never the tactical manipulations of the salespeople involved. I learned early on in my sales career that it was far more important and profitable to “open” the sale precisely than it was to close strongly. If I spend a lot of time, energy and mental acuity on learning the precise dimensions of the customer’s needs, and if I crafted an offer that matched those precisely, there was very little need for concern about closing. I realize that I am tramping all over the hallowed ground of a vast number of sales managers, sales trainers and sales consultants. I am, however, reflecting thoughtfully on my 30-plus years of selling all kinds of things, and my 18-plus years of training and developing sales people. I believe that most thoughtful salespeople will line up on my side of the issue. All that said, there some principles and simple rules that can give us direction on this issue. Let’s start with our language. Instead of “closing the sale” let’s first call it “resolving the next step.” Not only should the project in general have a resolution, but also every sales interaction (a conversation with a prospect or customer), should have as its goal the identification of a next step in the sales process and the natural and logical commitment to that step. So, for example, when you are seeing a prospect for the first time, the ideal next step is to get a commitment from the prospect for a second meeting. Without that, you have no hope of getting the ultimate purchase order. To walk away from the sales call without resolving “what happens next” is to leave the sales call incomplete and relatively worthless. The ideal next step for a meeting when you are collecting information about the customer’s needs is the customer’s commitment to view your presentation of your solution. The ideal next step following a sales call in which you present your solution is for the customer to identify the next step in his/her buying process, and commit to that. If the goal is to successfully arrive at the ultimate resolution, the perceptive salesperson understands that the means to that is a step-by-step process. Every sales call is an investment of time and energy on the part of the customer. And every investment of time and energy should result in some kind of an action step. Unless you are so entertaining that the customer looks at his/her time invested with you as a substitute for the movies this weekend, he/she probably doesn’t want to squander his time with you. He probably wants to accomplish something as a result of his investment of time with you. The something will take the shape of a “next step” in his process. So, the thoughtful and effective salesperson recognizes that, and merely asks the customer to identify the next step. When he does, it’s nailed down with a deadline. The project moves forward, the sales process continues, and you know exactly where you and the customer stand. All of that brings us to one the most powerful “resolution” strategies. I call it “Alternate next steps.” The definition is this: An alternate next step is an offer made to the customer following the stated or implied rejection of a previous offer. It always involves a smaller risk on the part of the customer, like plan B. If the customer agrees to the alternate offer, it always keeps you in the game and the project moving forward. Here’s an example. You are offering a one year contract on a product which the customer uses every month. The customer indicates that he’s not ready to sign that. Instead of confronting the issue, you resolve it. You offer plan B, an alternate next step. You suggest, instead, that the customer buy two months worth of the product to see how it works out, and then you and he will get together to assess the benefits of continuing. Instead of a 12 month contract, your offer is a two month trial. Does that offer represent less risk to the customer? Of course. If the customer agrees to that step, are you still in the game? Is the project still going forward? Yes to both. You see, the reason the customer didn’t say yes to your original offer has to do with his concerns – perhaps issues that have nothing to do with you or your product. By offering an alternate next step, you reduce his risk, and provide a mutually acceptable way to resolve the next step. The reason he didn’t offer a positive solution to your original offer has more to do with you missing something in the customer, than it did with your lack of verbal dexterity. Remember that effective “opening” is the best single tactic for closing. Create a habit of always asking for action as a way to resolve every sales interaction. If you can execute these four things with ever growing excellence, you’ll enjoy your customers respect, you’ll maintain positive relationships and become far more important to them, and, you’ll far outsell the manipulative “closers” surrounding you. 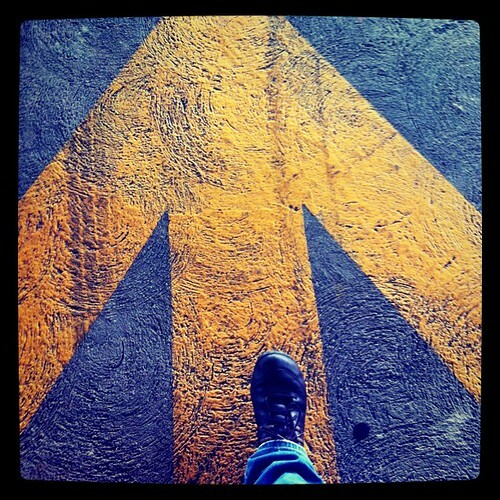 Image “a step in the right direction” by downbeatpuppet on Flickr under Creative Commons license.